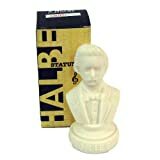 Grieg, finely detailed porcelain ivory-colored composer statue. This solid stone like figurine stands 5" tall, has a 3" base with a felt bottom. Gift boxed. Set of 18 Halbe SMALL Music Composers Statues Statuettes 3 1/2"